I know a blog is about telling you some source of information, but in this case, I just want this picture to sink in just for a moment. There are many other words I can think to describe this monstrosity; indulgent, filthy, gluttonous. Oh and darn delicious too. 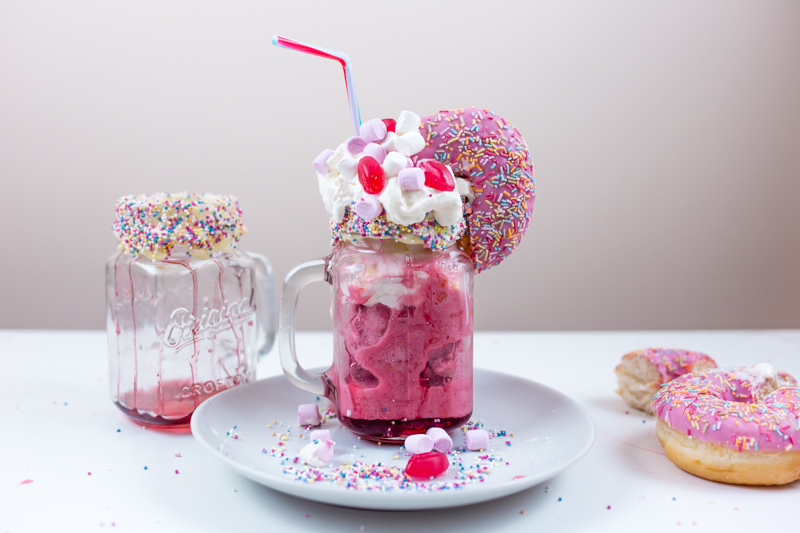 All hail the Freakshake. I was feeling pretty sorry for myself this last week. I was supposed to go out at the weekend with friends, but ended up running myself into the ground, getting sick and to top it off, my eye decided to explode. OK not literally, but it puffed up so much it hurt to close my lid. Talk about one thing after another. So feeling pretty much housebound, I wanted to drown my weekend in sugar. And that’s really how this was born. 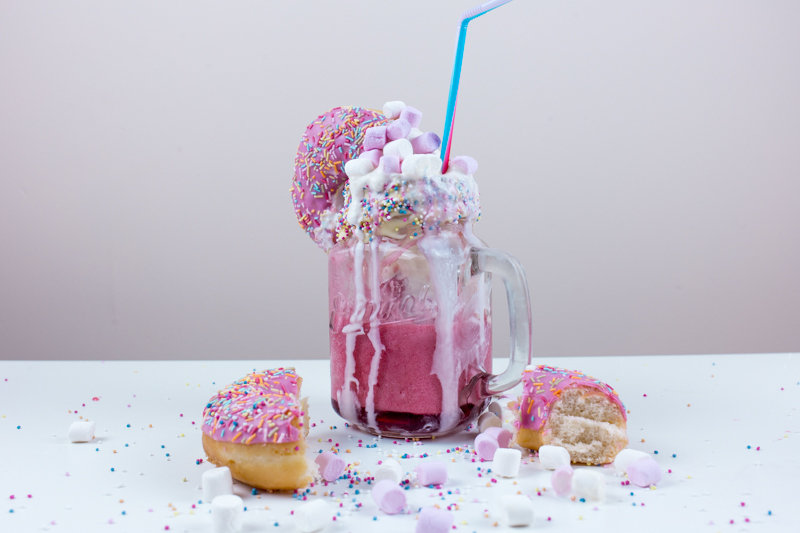 The Freakshake gained notoriety last year. I believe it started in a café in Melbourne (sources are contradictory as to where) and it went viral around Instagram. Well you can see why. So if you are feeling like you want to indulge in something sweet, or make something to impress your friends then keep on reading. 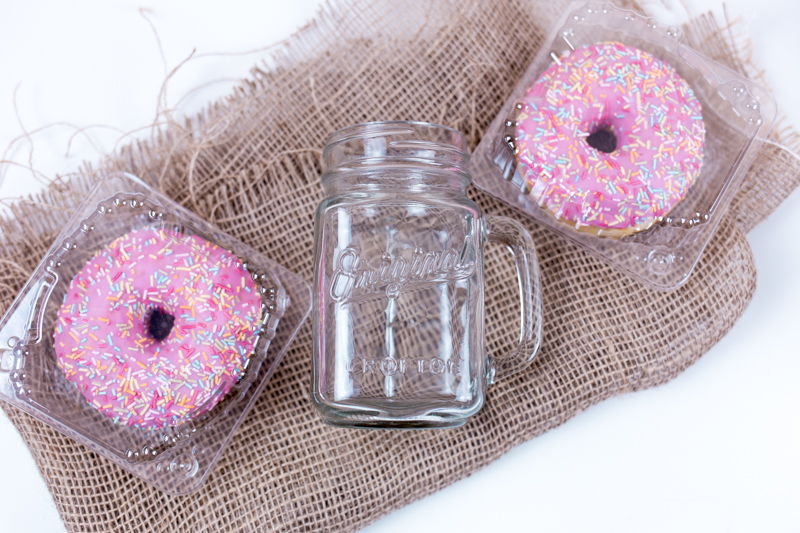 2 glasses (I picked these mason jars up for 0.99p from a local charity shop. So it’s always worth popping in to see what you may find. First melt your chocolate in the microwave in a shallow bowl. Then once melted, take your glass and dip in upside down so the rim is covered, then using a knife paint just down the side just underneath the rim. 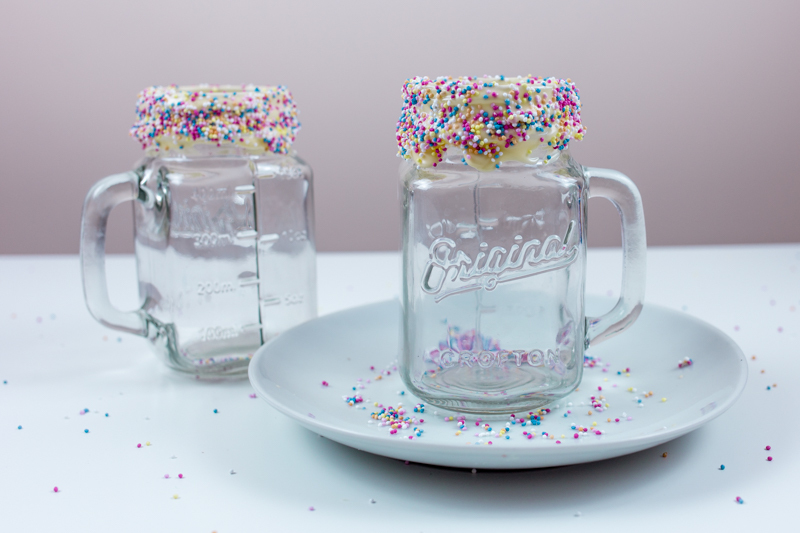 Then take your sprinkles and sort of sprinkle them on. I tried rolling them in on a plate but the chocolate just stuck to the plate, so sprinkle them on instead. Once done leave to set. 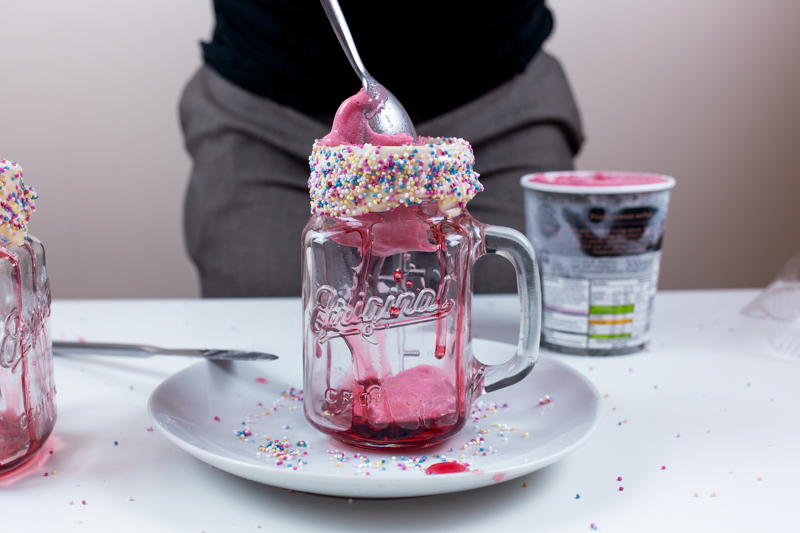 Once set, using your ice cream sauce, squirt down the sides of the inside glass, causing a drippling effect. Now fill ¾ of the glass up with ice cream, and then top with whipped cream. 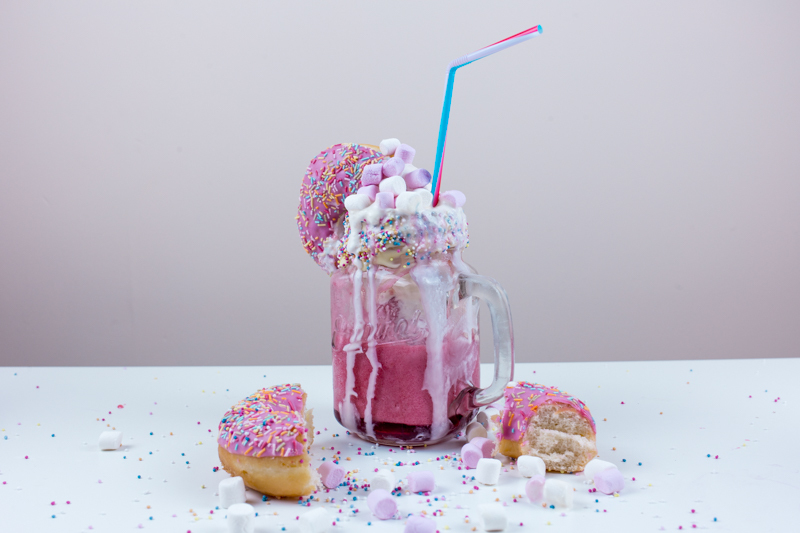 Cut about a 5th of your doughnut off and hook it over the rim and finally to with marshmallows and insert your straw. 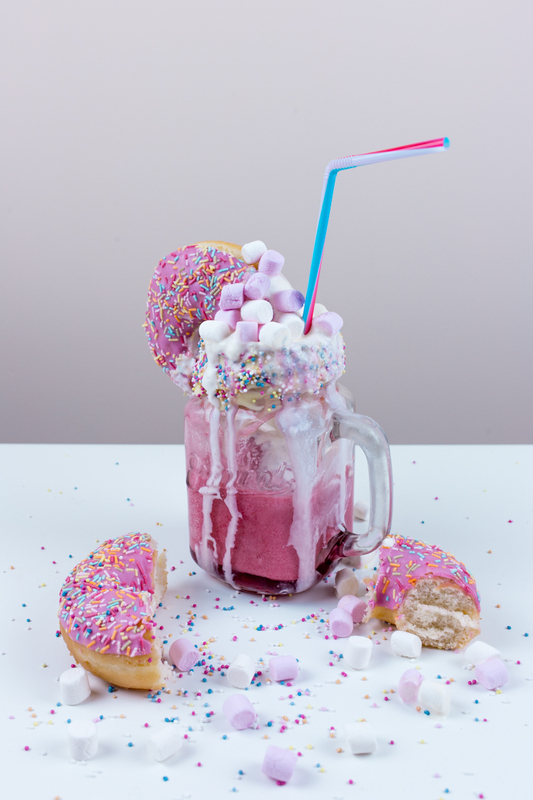 One strawberry, marshmallow and doughnut freakshake. As you can see at first I did attempt to also add pink lip sweets, but they proved too heavy for the cream. Also, after about 5 minutes the cream started to drip down the glass, which the next few photos show. I think that adds to the photo, but in reality? Best to have some napkins ready! My only disclaimer is, is that you can't come blaming me if you get sugar rush from this. You have been warned. If you make this, please do tag me in your photos. I'd love to see your wild creations. 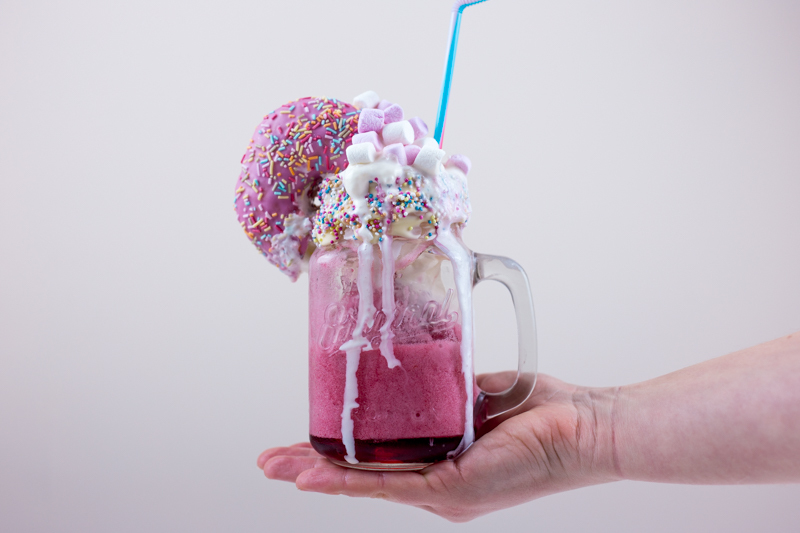 I'm on slimming world at the moment but as soon as I hit target I am 100% making one of these! Maybe I could make a slimming world option! Such a great post lovely and great photography, I will be bookmarking this post for future reference hehe! This looks amazing! My niece especially would be all over this.